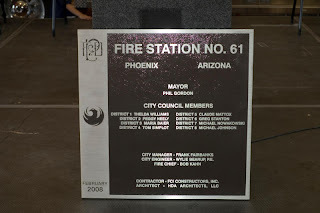 Yesterday March 29th 2008 was the grand opening of the Phoenix Fire Departments Station 61. Mike, Chris, Sean and I attended. You may note in the picture below that the billboard is missing, I removed it digitally. 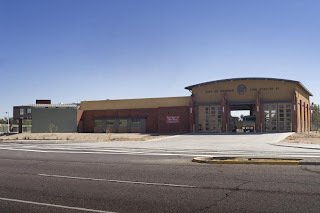 The new station is 10500 square feet, and instead of the barracks style sleeping arrangement of many older stations, this fire house has 9 individual dorm style sleeping rooms. This fire house also has a separate entertainment room. With recliners and a wide screen HDTV. hmmm... Looks like their favorite program is on now. There is a second HDTV in the dining area. This station boast an awesome kitchen, with 3 refrigerators. There is even a complete weight room. Strangely though there are only 4 bathrooms. All of them have 1 shower and 1 toilet, even though there is room for several stalls in each, limiting the number of people who can use a bathroom at one time, and each of the bathrooms is labeled differently. One is labeled as "restroom" one as "toilet" and one as "bathroom" I don't remember what the fourth one was called. There is a room just off the bay where the turnout gear is kept. The bay has room for 3 apparatus. 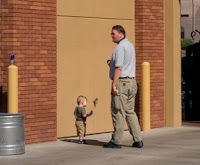 The front doors fold open horizontally. They can open electrically or manually. The open very fast, and they have infrared light sensors to prevent the doors closing on an apparatus. When we arrived we had missed the landing of "Firebird 10". They landed the helicopter right in front of the station. There were some little turnout coats, pants and boots on the front of Engine 61. These were for kids to dress up in and get their picture taken. Here is an interesting comparison. On the left of the pictures below is the radio from a PFD station taken in the late fifties/early sixties. The cabinet on the right side of the left picture "is" the radio and had one frequency. Contrast that with this station. The radio is a tiny little unit in the center of this cabinet, and has (I believe) at least 10 channels. This cabinet also contains an LCD monitor and a Dell 1U rack mounted server at the bottom. Quite a lot of people showed up and there was even an unlucky fireman who was dressed up in an inflatable smoke detector costume. Because of the way the costume is made the guy inside walked in a bizarre 1950's robot looking way. Maybe Mike will post the video on his website. 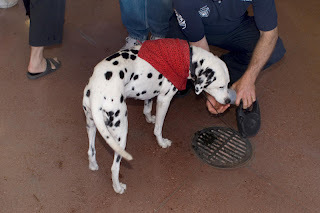 One of the firemen even brought a Dalmation. OH MY GOD!!! another Humat valve!!! Here are some Misc. 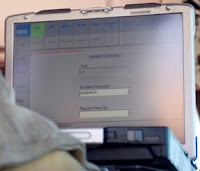 equipment and apparatus pics. And some pics of wildlife. There was food and trinkets available but at about the time all of the "dignitaries" arrived and were giving their speeches we decided to leave and have Mexican food at Carlos O'Brien's. Of course the food at the station was not served until "after" the speeches (you have to pay for your meal somehow). Here is the dedication plague for the station.